The Los Angeles Express had a 3-3 record, as did all three other teams in the Pacific Division of the United States Football League, as they met the Tampa Bay Bandits on April 18, 1983. Coached by Hugh Campbell, winner of five straight Grey Cups with the CFL’s Edmonton Eskimos, the Express had difficulty scoring points with the quarterback tandem of veteran NFL backup Mike Rae, who started games, and rookie Tom Ramsey, who typically finished them. 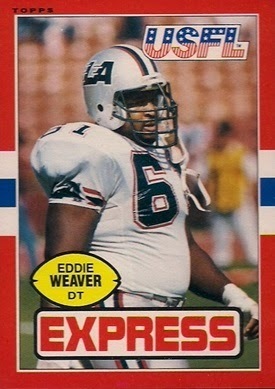 The defense was tough, however, especially the line that was anchored by rookie NT Eddie “Meat Cleaver” Weaver. Tampa Bay, coached by the offensive-minded Steve Spurrier, featured an exciting aerial attack directed by veteran QB John Reaves, a former college star at Florida who had floundered in the NFL. The Bandits had won their first four games before being thrashed by the Chicago Blitz, but were 5-1 and playing at home as they faced the Express. It was a rainy Monday night with 32,223 fans in attendance at Tampa Stadium. The quality of play was sloppy, and the first half was filled with penalties. Tampa Bay took the early lead midway through the first quarter when Zenon Andrusyshyn booted a 40-yard field goal. The Express responded on the ensuing series by going 56 yards in 12 plays that culminated in Vince Abbott kicking a 35-yard field goal with 2:25 left in the opening period. Four plays later and now into the second quarter, it was Andrusyshyn’s turn again to put the Bandits back in front with a 29-yard field goal. The series was helped along by a roughing-the-passer call on DE Dennis Edwards. LA was helped on its next drive by two penalties on the Bandits to move into field goal position, with Abbott connecting from 36 yards. Late in the second quarter, and with the score tied at 6-6, Eddie Weaver of the Express put pressure on Reaves that caused a poorly thrown pass which was intercepted by SS Mike Fox. But with the ball at the Tampa Bay 10, the visitors couldn’t reach the end zone. NT Fred Nordgren made a shoestring tackle on RB John Barnett to save a possible score, and then Tom Ramsey dropped the snap on third down. LA came away with a 24-yard Abbott field goal as the clock ticked down to 42 seconds and took a 9-6 lead into halftime. Down by three points in the third quarter, the Bandits stopped the Express at their own 15 and forced a punt that gave them good starting field position at their own 48. However, after advancing to the LA 42, a false start backed them up five yards and then Reaves was again picked off by Fox. Heading into the fourth quarter, and with 12:31 to go, the Express went ahead to stay on a one-yard touchdown carry by RB John Barnett – the first LA touchdown in over ten quarters. It followed a Reaves fumble that was recovered at the Tampa Bay 17 by Dennis Edwards. The turnover was compounded by the loss of Reaves, who left the game with a broken wrist suffered while being tackled, thus forcing the fumble. Backup QB Jimmy Jordan helped narrow the margin with a 23-yard touchdown pass to WR Danny Buggs midway through the final period, but the Bandits never threatened again for the remainder of the game. They reached the LA 40 on their final possession before giving the ball up on downs, and a roughing-the-kicker penalty kept the Express from having to give up the ball again until there were just 27 seconds left. LA added two points by dropping Jordan for a safety shortly thereafter and won by a final score of 18-13. The offensive statistics reflected the closeness of the score. The Bandits held the edge in total yards (260 to 258) and first downs (17 to 16). The big difference was in turnovers, with Tampa Bay giving up five (four interceptions, one fumble) to none suffered by LA, even though the visitors fumbled four times. The Express defensive line put heavy pressure on the Tampa Bay quarterbacks throughout the contest and recorded five sacks, while the Bandits had two. Mike Rae completed 13 of 25 passes for 140 yards with no touchdowns, but also no interceptions. RB Tony Boddie rushed for 59 yards on 11 carries and John Barnett was right behind with 55 yards and a TD on 19 attempts. TE Ricky Ellis led the receivers with 6 catches for 65 yards. On defense, Eddie Weaver had two sacks and Mike Fox accumulated three interceptions. For the Bandits, John Reaves had a miserable day before leaving due to injury, completing just 7 of his 27 throws for 81 yards while giving up four interceptions. In relief, Jimmy Jordan went 8 of 10 for 97 yards and a TD with none picked off. RB Sam Platt ran for 107 yards on 21 carries and caught four passes for another 16 yards. Danny Buggs led the team with 62 yards on three pass receptions that included a TD. The Express went on to an 8-10 tally that placed them second in the mediocre Pacific Division. Eddie Weaver received All-USFL recognition from The Sporting News for his play with the league’s fifth-ranked defense, but even with upgrades to the receiving corps, the offense continued to have difficulty scoring points. As for the Bandits, the loss that dropped them to 5-2 was all too reminiscent of the one two weeks earlier against the Blitz and a harbinger of harder times to come. Still, with Jordan at quarterback, they managed to remain competitive, even after he, in turn, went down with an injury. Tampa Bay stayed in the playoff hunt until the last week, ending up with an 11-7 record that meant a third place finish in the tough Central Division and just outside the postseason.